Little hint that can save you some grief down the track with Road racers especially Two Strokes people make the Big Mistake when jetting of trying to clean up the mixture for a clean response off the line usually if for instance the bike is rich they go to a smaller Pilot jet and all seems good, Until !!! it seizes on the overrun into a Corner the last place you want that to happen. This is why, Slides are expensive so usually people just change the jets and that can catch you out with a Two Stroke, Imagine you back off at 120 MPH at the end of a long straight, At that point you are running the engine at high Revolutions and running on the Pilot jet, Too small a Pilot jet and it seizes. 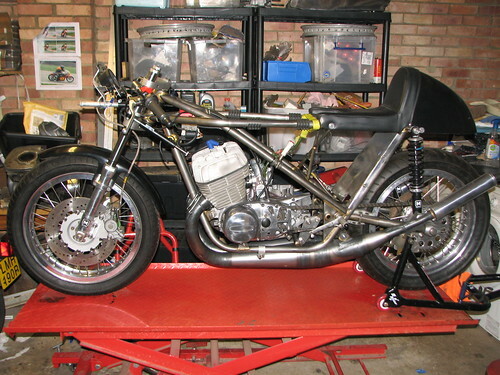 If the bike is Doughy in Response off the Line and the Pilot jet mixture screw is about at carburettor manufacturers specs on the number of turns of adjustment then to fix a rich mixture you need a different Slide Cutaway number. Slide Cutaway numbers on Most carburettors are measured in MM so a 2.5 Cutaway Slide means the difference between the Flat base section and the raised Cutaway is 2.5 MM, Most slides can be adjusted carefully up to about one full MM by careful marking and measuring, Mark with a felt texta pen and measure with Verniers and simply carefully File the slide to the required dimensions to make the change, Make sure however which way you need to adjust things as you cannot replace metal removed. Then carefully dress the area you modified with an Oilstone and happy Days the hopefully right cutaway and at minimal cost, Slides especially Chrome plated Brass ones are expensive. Remember rich off the bottom end means more cutaway and hence more air is needed to fix the richness and if lean the opposite, Always do this after making sure the Pilot jet size is correct and as above the guide there is the Air Mixture screw adjustment, For Instance Mikuni carburettors standard Mixture screw settings should be between 1.5 to 2.0 turns out from softly bottomed in. 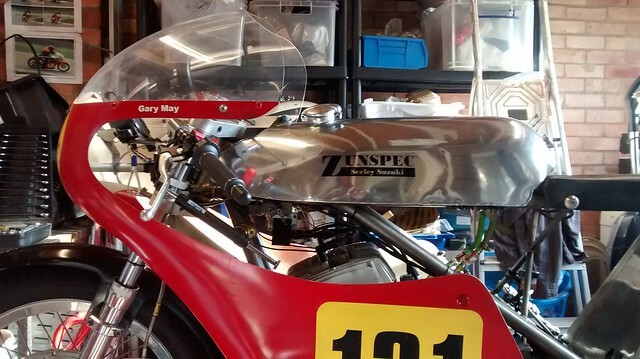 Well after a year since the last post I have finally got a new race engine, new pipes, carbs, suspension upgrade, bigger tyres, digital ignition and a bunch of other refinements. After winning the first two races at Pembrey last year with Gary May on-board it all went down hill. All due to a rapidly failing engine, finished with major seizure at the following meeting at Lydden Hill (when leading race). The replacement race engine has been a long time coming but has been prepared and tuned by one of the UKs top 2-st tuners. We hope to get a race in by the end of the season. Looks great Zun - interesting what you say about the carbs. In my experience, two strokes are more likely to seize when you back off the power. You've just explained why. Yep, shutting down to brake at the end of the straight is a tricky time for a pre-mix 2-st. All that lovely oil rich main jet mixture suddenly disappears just when the engine has been making max power (and heat). A day at the dyno is scheduled with the tuner on-hand to get the carburation and ign sorted, slide cutaway will be changed if necessary. The only time I've really knackered a two stroke was after coming off the gas. I holed a piston. It was using an oil pump. But it was an old knacker anyway. Very nice, I bet your neighbours loved you that day. hondapartsman wrote: Very nice, I bet your neighbours loved you that day. 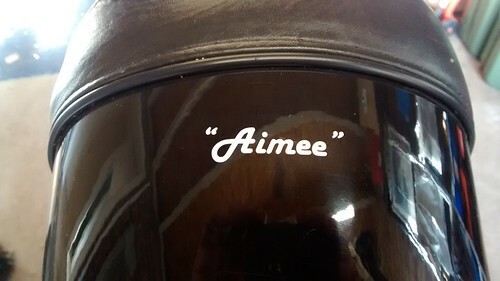 Added a tank graphic, I had them made up at the local sticker making firm, Tank badge, riders name and an "Aimee" for luck (x 12 off) for £20. Noise test at Castle Combe on Saturday with an ACU test day at Brands on 18th Mar. First meeting with CRMC is on the Easter weekend (25 - 27 Mar) at Pembrey. 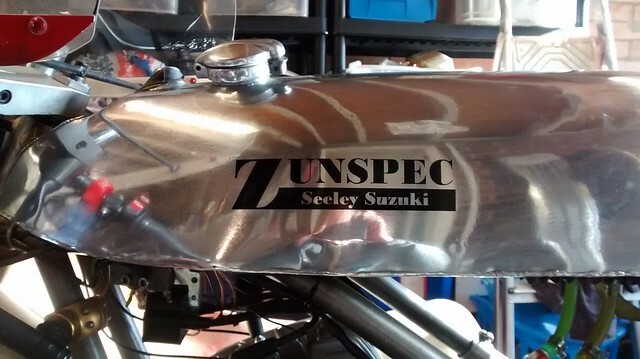 That looks stunning Zun - just a thought but what time will you be testing at Brands? and would anyone be able to rock up? I work pretty close by. Last edited by scotduke on Fri Feb 12, 2016 11:33 pm, edited 1 time in total.